Household waste only, no construction or remodeling waste. No Household Hazardous waste (paint, pesticides, oil, gas, antifreeze, corrosive chemicals, etc.). For more information on Household Hazardous Waste contact the Loudoun County Office of Solid Waste @ 703-771-5500. Please visit Patriot’s Recycling Page for a full list of items you can and cannot recycle. Grass clippings and leaves should be bagged. Brush and limbs should be bundled. Limbs should not exceed four feet in length and six inches in diameter. Items that are bagged or bundled are not to exceed 50 lbs. Concrete, bricks, blocks and dirt are not acceptable. Patriot offers a Bulk Removal Service at an additional charge per item. Bulk Service includes items such as mattresses, sofas, tables, chairs, etc. Call Patriot at 1-703-257-7100 at least 24 hours in advance for pricing and scheduling. Trash and recyclables pickup are provided on all holidays that fall on a regularly scheduled pickup day. The only exceptions are: Thanksgiving Day, Christmas Day, and New Year’s Day. When a designated pickup day falls on one of these holidays, trash and recyclables will not be picked up. In these situations, trash should NOT be placed outside in designated areas until the next regularly scheduled pickup. Christmas trees are collected on the regular yard waste pickup day, which is Wednesday. Remove all tinsel and decorations from trees and do not place trees in plastic bags. 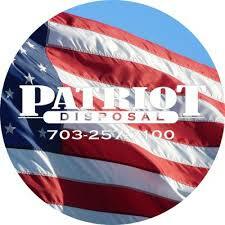 Contact Patriot Disposal at (703) 257-7100 if you need a trash or recycling toter. You may also purchase your own trash toter at local home improvement stores. Trash shall be placed at the curb for pick-up in containers manufactured for trash storage purposes only. Residents must ensure trash containers have securely fitting lids at all times. Paper or plastic bags are not sufficient for trash removal due to the likelihood of animals breaking into them. Single-family home trash containers may remain outdoors so long as they are kept either along the side of the house, or out of view in the rear of the house. Please see ARB Guideline 6.11 for details on keeping containers at the side of the house. Trash containers shall not be stored anywhere in front of the house or driveway. All recycle bins must be stored inside the home. Loudoun County has had a mandatory recycling requirement in place since 1991 for both residents and businesses. New recycling requirements became effective January 1, 2003. These requirements make it mandatory for residents to separate newspapers and magazines, container glass, metal and aluminum cans and plastic beverage and detergent containers from household waste for recycling. Additionally residents are also required to separate cardboard, paperboard and yard waste. Household Hazardous Waste (HHW) e.g. Oil-based paints, thinners and solvents; corrosives; insecticides, pesticides and herbicides; gasoline, kerosene and diesel; photographic chemicals, hobby and pool chemicals; and rechargeable batteries. Also household cleaners and disinfectants; lighter fluid; some automotive car products; hobby chemicals and glues; moth balls; and wood preservatives. Call the office of Solid Waste Management for more information. Visit the County’s Waste Management web page for Directions, Hours of Operation and details of other services available. Motor Oil, Anti-Freeze and Automotive Batteries can be recycled year round for free at the county landfill recycling center on Evergreen Mill Road. Visit the County’s Landfill Recycling Center page to view location, hours of operation and other available services at the Evergreen Mill Road facility. Computers and Other Electronics – Loudoun County holds two electronics recycling collection events annually, one in the fall and one in the spring. Visit the County Electronics Recycling web site to view the latest Loudoun County Recycling Event Schedule. Check Patriot’s Website and/or Facebook page for latest information on suspended pickup due to weather. Christmas trees will be collected on the regular Yard Debris collection days. We ask that all tinsel and decorations are removed. Please do not place trees in plastic bags. Safety in your community is Patriot’s primary concern. Roads and/or areas which are deemed unsafe due to snow or ice will be suspended for collection. If suspension occurs, services will resume on the next regularly scheduled collection day.